The Storehouse Visitor Centre has been created in part of the brewery which is no longer used. 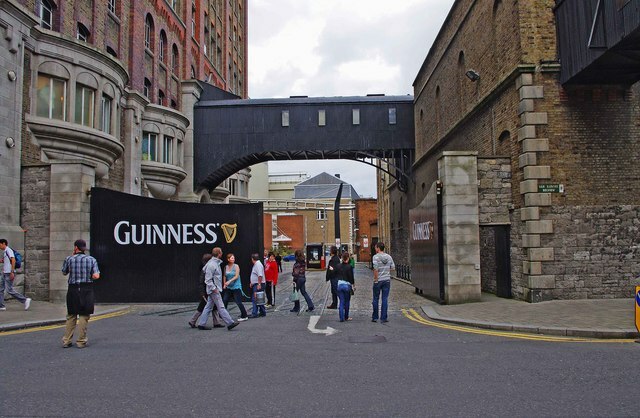 Over several floors the history and process of brewing the famous Guinness stout are explained. Additionally there is a large shop selling Guinness labelled memorabilia, which includes everything from clothing, to mugs and chocolate bars. Topping it all, literally, at the very top of the building is the Gravity Bar, with magnificent views of the city of Dublin, and the ticket price currently includes a free pint of Guinness! Entry for visitors is through the huge gates, which can be seen in this picture. Robert Street South appears to be one of a number of private roads serving the vast brewery complex. A word of advice for visitors, to avoid long queues book your ticket in advance. Currently it is cheaper to do so online. © Copyright P L Chadwick and licensed for reuse under this Creative Commons Licence. This page has been viewed about 292 times.